We love romantic comedies, but even as fans we can admit that some are laden with clichés and formulaic stories. Not the gems — like LOVE, SIMON and CRAZY RICH ASIANS — but the not-gems are certainly out there. This Valentine’s Day we’ll see a film that takes the genre apart and puts it back together again: ISN’T IT ROMANTIC. The film comes from director Todd Strauss-Schulson, who brilliantly reworked the cliches of horror in THE FINAL GIRLS. 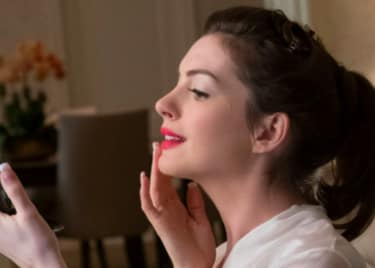 Now he goes meta to explore everything we love about romantic comedies, complete with musical numbers, in a film about a woman who hates rom-coms and freaks out when she realizes she’s living in one. We’re already in love with the film’s actors: Here’s a guide to the cast of ISN’T IT ROMANTIC. Rebel Wilson (PITCH PERFECT, HOW TO BE SINGLE) plays Natalie, an Australian architect who gets knocked out after fleeing a mugging attempt. When she wakes up, the self-aware Natalie finds herself transported into a fantasy universe resembling a romantic comedy. Everything looks perfect, but she does not feel perfect. 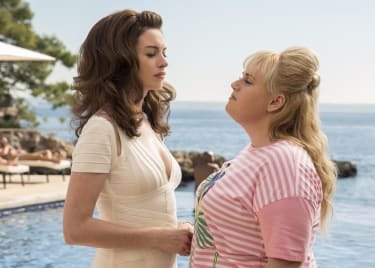 Natalie gets stuck in a love triangle, and quickly becomes desperate to escape the rom-com clichés to find true love and get back to reality. 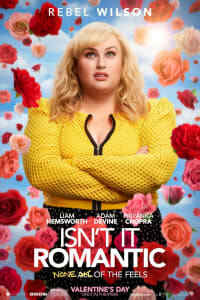 Rebel Wilson has played many supporting roles, but this is her first major lead role. We’re excited to see Wilson’s comedic chops put to use in the inside-out parody of ISN’T IT ROMANTIC, which has the potential to completely dissect everything we love about the romantic comedy. This film is also a PITCH PERFECT reunion between Rebel Wilson and Adam DeVine. The actor plays Natalie’s best friend Josh, who is also one of her love interests. Josh might have his sights set on another woman, however, which could complicate matters for Natalie. DeVine and Wilson have been paired a few times in the past. Not only were they in the first two PITCH PERFECT films together; they also did the TV series WORKAHOLICS. According to the trailer, the duo share a few more musical numbers in this film. DeVine also played an important role in THE FINAL GIRLS, from ISN’T IT ROMANTIC filmmaker Todd Strauss-Schulson. Another famous Aussie joins Rebel Wilson in this cast. Liam Hemsworth, of THE HUNGER GAMES trilogy and INDEPENDENCE DAY: INSURGENCE, is on hand to make Wilson’s character more than a little nervous. He plays Blake, one of Natalie’s clients. She sees the guy as a flawless specimen — and she’s probably not alone in that outlook — so her involvement with him in the fantasy universe ignites a fiery confusion within Natalie. We haven’t seen Hemsworth do any musical numbers before, so that possibility is reason enough to buy a ticket. Betty Gilpin of GLOW plays Natalie’s assistant Whitney, who is also one of her best friends. Prior to “the incident,” Whitney questions Natalie’s cynicism toward romantic comedies, and love in general. Whitney’s reaction to Natalie thinking she’s stuck in an alternate universe is one of the film’s scenarios with the greatest comedic potential. Priyanka Chopra (QUANTICO, BAYWATCH) stars as Isabella, a yoga ambassador. While she’s been in other Hollywood films, this is Chopra’s first American romantic comedy — but she’s got a master’s experience with the genre thanks to a history in Bollywood productions. She will take part in the musical numbers which she is, of course, no stranger to within films. ISN’T IT ROMANTIC opens on February 14.